I’m still having trouble with proportions when I draw blind*. In the sketch below, The line I drew to demark the subject on the right-hand side of the page, was too wide, and included her ear. 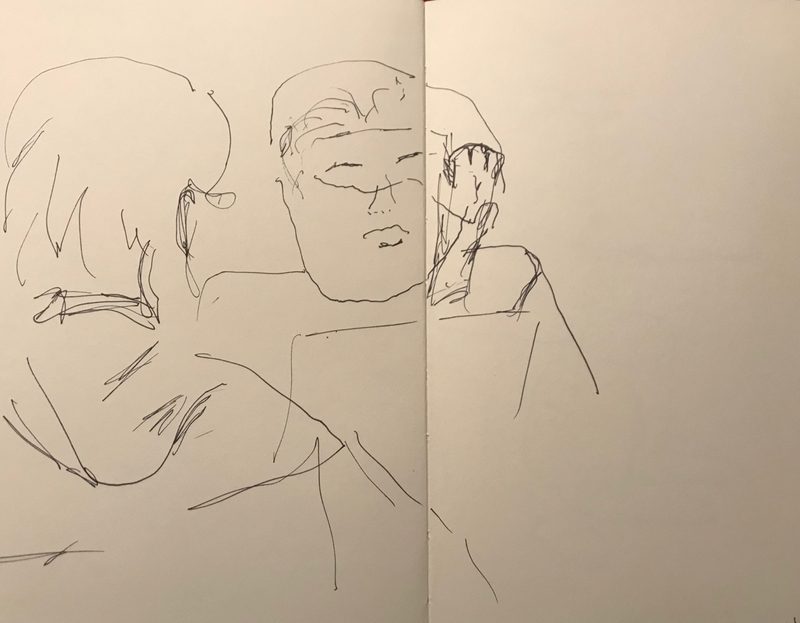 I abandoned the blind drawing technique and overdrew these lines in an effort to repair the sketch, As part of that repair, I drew in the woman’s hand that she brought to her face momentarily. *Drawing without looking at the sketch book page. This entry was posted in Personal Stories and tagged blind drawing, drawing, drawing mistakes, fixing mistakes, pen and ink, pen and ink sketch, portrait, sketch, sketching errors, visual art. Bookmark the permalink.